Gratitude abounds in an author’s life when a book you have written receives an award. This is particularly true for this author because the “Body, Mind, and Spirit Book Awards” awarded a “Finalist” award to my book this past month. Note the beautiful award seal on the front cover. When I wrote this book in 2016, my intention was to share the wisdom I had learned as a result of becoming a Caregiver for my husband in 1991. My sole goal, was to help other Caregivers not only survive as a Caregiver, but to thrive! I felt then, and still do, that my life’s purpose is to contribute to the knowledge and wisdom of the information available to Caregivers. As I did the research for the book, I read a lot of other books for Caregivers. Almost all the books I found at that time were valuable as tools for Caregivers in the day to day management of someone else’s care. They covered how to hire help, where to find resources for Caregivers, and medical information about stroke. A few other books were inspirational stories about celebrities or individuals who had learned and changed as they survived their own strokes. Most of the books I discovered at the time were not focused on the spiritual, social, and mental health of the Caregiver. In reality, I only found one other book that took a spiritual approach to Caregiving. That one book was “The Caregiver’s Tao Te Ching” by William and Nancy Martin. Their book so moved me, that I contacted Bill through his publishing company and asked if I could use some of their wisdom to add to my book. Miracles do indeed occur in this life. I truly wept when I was given permission to use their work. You’ll find it at the beginning of the book and at the end of nearly every chapter in my book. When I realized that an important key to the Survive and Thrive goal I had in mind was unique, I knew that I had stumbled upon a missing key for Caregivers. I had found a niche for my true purpose. Now, “Body, Mind, and Spirit Book Awards” whose goal is “Shining Light on Books that Enrich the Human Experience”, has granted my book an award. This award has given me reassurance that my purpose in life has been achieved in this arena. My joy at receiving this award is validation of what I intended in this process. My heart is filled with gratitude and sense of completion that I never anticipated – beyond the completion of the book. Thank you forever, to the “Body, Mind, and Spirit Book Awards”. and then scroll to the Self-Help Category. 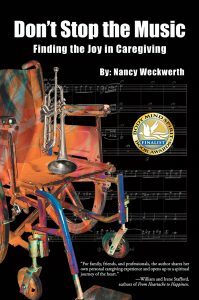 You’ll find “Don’t Stop the Music: Finding the Joy in Caregiving” alphabetical by author in the Finalists category.